Some may call it excessive, unreasonable, exhibitionist. What kind of masochist wants to stare at a billion pinpricks of light all at once, anyway? Why, the scientifically inclined one, of course. The astronomer who’s hellbent on picking apart the universe and reducing your life to a clump of dust needs absurdly detailed star charts in order to do so. Today, the European Space Agency unveiled a new celestial map, built from the first 14 months of the Gaia satellite’s 5.5 year observational campaign, which began in July 2014. With more than a thousand million stars packed in, it’s the most complete map of our galaxy ever created, revealing objects a million times fainter than what can be seen with the naked eye. “Today’s release gives us a first impression of the extraordinary data that await us and that will revolutionize our understanding of how stars are distributed and move across our Galaxy,” Alvaro Giménez, ESA’s director of science said in a statement. Although the map released today is but a small taste of what’s out there—it only represents about 1 percent of the stars in our galaxy—the most significant galactic structures are already visible. Intrepid spacefarers who’d like to zip off to the action-packed galactic plane can see it depicted here as a bright streak, running horizontally across the Milky Way’s midsection. Those who suspect ancient alien civilizations are lurking in globular clusters can use this map to pick out dozens of potential targets. Although unless you have hawk eyes, you’re going to need a magnifying glass. Most of us would probably give up and go home after churning out the most complete celestial map ever in just 14 months—but not Gaia. This satellite wasn’t built to chart stars, but to chart their movement across the celestial landscape. By the end of its mission, Gaia is expected to have observed the billion stars you see here approximately 70 times each, creating accurate measurements of their position, velocity, luminosity and composition. Its final data archive is expected to exceed a Petabyte. 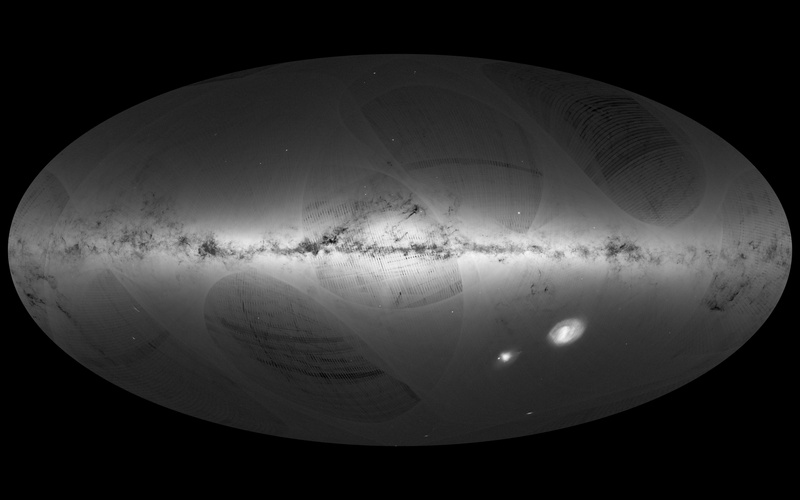 Ultimately, Gaia will give us a moving, 3D model of our galaxy’s celestial choreography. With it, we can start to understand the physics underpinning this brilliant clump of gas and dust we call home.